Breaking down how the story of Ryan Lochte’s controversial alleged robbery developed. On Sunday, news broke that Ryan Lochte and three other U.S. swimmers had been robbed at gunpoint while riding in a taxi in Rio. In the days since, however, authorities in Brazil have questioned the veracity of Lochte’s claim. Below is a timeline of how the story developed—including the latest bizarre twists. 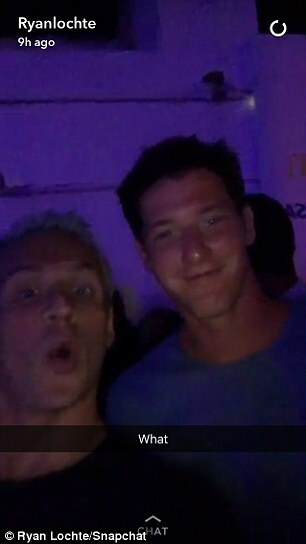 This much we know: Lochte was one of several swimmers to attend a party at Club France on Saturday night. The club is located at the Jockey Club Gavea, about a mile off Ipanema beach. It’s a more affluent part of Rio, where police say violent crime is less frequent. 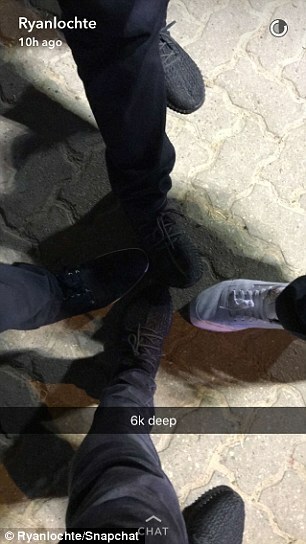 Lochte posted several Snapchats from the party, including one that was apparently a reference to the value of his group’s shoes. The news of the robbery was first broken by Ben Way of Fox Sports News in Australia. Way reported that the robbery occurred at a party, while Lochte later said he was in a cab. BREAKING: @USASwimming Gold medallist Ryan Lochte has been held up at gunpoint at a party in Brazil. Way also reported that Lochte was with Brazilian swimmer Thiago Pereira at the time. Lochte invited by Brazilian swimmer Thiago Pereira, and is now safe at @USASwimming base. @FOXSportsNews told 3 teammates were with him. Ileana Lochte told USA Today that her son said he and at least one teammate were robbed. The Washington Post spoke to Flavio Perez, a spokesman for Pereira, who detailed where Lochte was when the robbery occurred and who he was with. USOC spokesman Patrick Sandusky confirmed in a statement that Lochte and three teammates had been robbed. "We got pulled over, in the taxi, and these guys came out with a badge, a police badge, no lights, no nothing just a police badge and they pulled us over," Lochte said. "They pulled out their guns, they told the other swimmers to get down on the ground—they got down on the ground. I refused, I was like we didn't do anything wrong, so—I'm not getting down on the ground. "And then the guy pulled out his gun, he cocked it, put it to my forehead and he said, 'Get down,' and I put my hands up, I was like 'whatever.' He took our money, he took my wallet—he left my cell phone, he left my credentials." A spokesman for the Rio Games apologized to Lochte and the other swimmers. Police said Tuesday that they found no evidence that the robbery had actually occurred. Lochte’s group did not call the police, and he and another swimmer were unable to remember details of the incident when interviewed by police. Both swimmers said they had been intoxicated. Lochte told police that he returned to the Olympic Village at about 4 a.m., but surveillance footage obtained by the Daily Mail shows Lochte, Conger and Feigen arriving just before 7 a.m.
A Rio judge ordered the two swimmers not to return to the U.S. as police continue to investigate the robbery claim. When police arrived at the Olympic Village to speak with Lochte and Feigen and seize their passports, they found the swimmers had already checked out. Lochte’s lawyer told USA Today that his client had returned to the States on Tuesday. The other two American swimmers who claimed to be present for the robbery, Gunnar Bentz and Jack Conger, were removed from their flight out of Rio. Feigen was supposed to be on the plane with Bentz and Conger, and reportedly checked in for his flight online, but didn’t show as authorities waited for him with “the equivalent of a warrant.” His whereabouts remain unknown to the public. Matt Lauer went on NBC’s nightly Olympic coverage with Bob Costas to relay the version of the story Lochte told him earlier in the week. Lochte did not affirm that a gun had been pointed at his head, and also said that the incident occurred while the cab was parked at a gas station, not that their cab was pulled over. NBC also aired surveillance video that shows the swimmers returning at 6:56 a.m., appearing to be in good spirits. ABC’s Matt Gutman reports that Lochte and three other U.S. swimmers were seen on surveillance footage “fighting” with security at a gas station. Lochte said in his revised account of the robbery given to NBC’s Matt Lauer that the swimmers were robbed at a gas station after using the bathroom. The returned to the taxi after using the bathroom and two men with badges and guns approached the car, Lochte said. The owner of the gas station told Brazilian outlet O Globo that the swimmers vandalized and urinated on the store. Globo TV also released security footage from the gas station. The video shows Lochte and the swimmers attempting to get into a cab that was not theirs, then after finding the right taxi, being asked to get out of the car by gas station security. The swimmers then sit on the curb as they talk to security. According to Globo, security used a gun to make sure the swimmers would not leave before police arrived and the swimmers agreed to pay for the damage they caused. Veloso also confirmed several previously reported aspects of the incident, such as that the swimmers had a gun pulled on them by gas station security and that the athletes were intoxicated. According to the Associated Press, Bentz and Conger testified in the case and had their passports released. They checked in for their flight out of Brazil after giving their statements. According to the USOC, Feign revised his initial statement and hopes to have his passport released soon. The USOC apologized for the “distracting ordeal” that resulted from the swimmers’ robbery allegations, calling their behavior unacceptable. “With three days remaining in the Olympic Games, our primary focus will remain on supporting the athletes who are still competing and celebrating the achievements of those who have finished,” the statement said.